According to UBS, an investment bank and financial services company, Nigeria are the 18th likeliest team to win the World Cup in Russia with a 0.3% chance. The Super Eagles, according to the report, stand the best chance of African team to win the World Cup with Senegal (21st, 0.2%), Morocco (26th, 0.1), Egypt (28th, 0.0) and Tunisia (29th, 0.0). Egypt’s low chances are surprising considering the form of Liverpool forward, Mohamed Salah. The PFA player of the year is the most important player for Egypt, who are a defensively sturdy side. Germany, Brazil and Spain have the highest likelihood of winning, according to the simulation carried out by the Swiss multinational firm. The simulation based on the ‘reliable indicators’ including the ELO rankings, ease of qualification and the level of success in previous tournaments. The report explains the ELO rating as an objective measure of team strength that considers how well a team has played in the past, the importance of the victories and the strength of the opponents to arrive at a number of points. 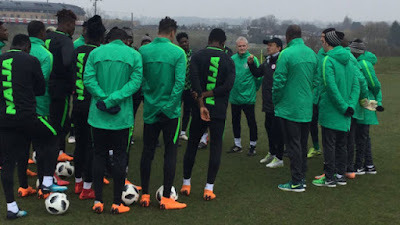 Nigeria clinched qualification for the World Cup before the final game against Algeria, which was eventually forfeited. The Super Eagles blitzed through the group that was considered the group of death in the Africa qualifying region. The team will hope to go further than the round of 16 where 1994, 1998 and 2014 teams reached but couldn’t go beyond. Placed in Group D alongside Argentina, Croatia and Iceland, it is believed the Super Eagles could have it tough getting out of the group. However, in the UBS report, Nigeria ranks above Croatia and Iceland, both generally considered the strongest opponents to a second place finish with Argentina considered favourites to finish top of the group. The Lionel Messi-led team are with a 54.7 per cent chance of finishing top of the group while Gernot Rohr’s team has a 25.5 percent chance of finishing second. Croatia and Iceland are with a 24.7 per cent and 23.5 per cent chance of finishing as runners-up in Group D of the 2018 World Cup. Argentina are ranked as the eighth country to most likely win the World Cup with the report claiming much will rest on the shoulders of Messi and the other top stars in the team. Nigeria’s standing as the 18th likeliest team to win the World Cup, in the UBS special edition publication titled Investing and football, is different from the CIES Football Observatory’s report that ranks Nigeria as the 22nd best team. However, the Observatory places Nigeria’s Group D opponents, Argentina and Croatia, seventh and eighth respectively while Iceland ranks 23rd best behind Nigeria.